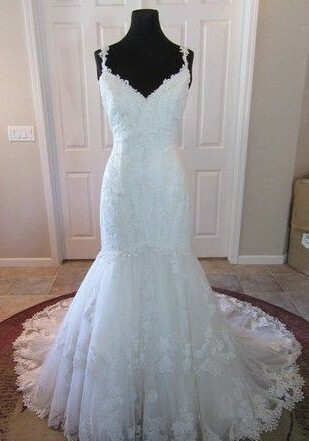 Brand new custom made Provonvias Umana Gown, never unpackaged from bridal salon, pristine condition. Classic detailing with a fit n flare tulle gown and a lace tiered skirt. The back of the dress is finished with covered buttons over the zipper and a chapel length train. The color of the dress is Off white/ Ivory, but seems a bit on the whiter side to me. Stunning, classic, beautiful. I have original receipt. Pictures are salon sample of gown. Once you send a message, Lori can invite you to purchase the dress.